I'm not sure if this weather can make up it's mind or not. Wednesday was so hot, I was actually a little delirious. Yet, on Friday I was cold! I call this the transitional period, which can make fashion very tough. Do I wear sleeves? Cover up? Well, I put my best (heeled) foot forward and gave transitional style ago. And if I do say so, myself, I think it went rather well. Come see. Before we jump into it, what do you think of my photography? I've challenged myself to learn more about the thing I love, so I have been taking this online LightRoom course, and the lesson I was up to this week was editing. I normally edit my photos in a basic, colour correction, exposure and so on, but this was about editing the feel of the photo, dependent on the mood. Anywho's long story short, I edited this for a faded, cool feeling, to match the tone of colder days coming. Let me know what you think. 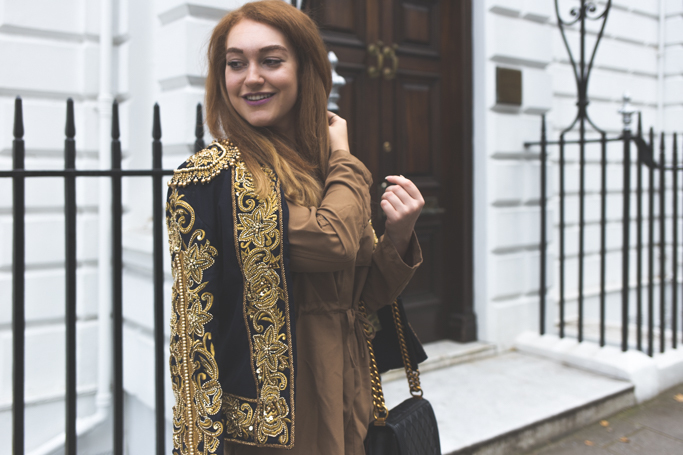 You'll have seen many times on my blog, me obsessing over this jacket. A good statement piece is ideal to carry you through the seasons, as you can really dress it with either pretty summer smocks, or over a roll neck jumper and jeans in winter. Also unless you've been hiding under a rock, you'll know these style of ankle boots are all the rage. I honestly thought I would hate them, but they are genuinely so comfy. I think it's so important to be able to have heels which you can walk from place to place in as lets be honest, unless you have oodles of cash, you aren't going to be getting a taxi door to door all the time. On the whole my look is very high street. I've got the odd couple of high end items, like my Chanel bag, but that's about it. For me, you can make a outfit look luxe through the details. I can't tell you enough how many times people have come up to me and asked if my jacket is vintage/ Balmain etc. What transitional pieces are you loving this autumn? Let me know below. I absolutely love that dress. It is the perfect Autumn colour, and it looks great on you. Love the jacket and the boots too, and I really like the cool tones of the photos that you've added here. I agree, it is so hard to dress here at the moment! I was freezing this morning but no idea if it will suddenly turn to 25 degrees this afternoon?! Perfecr transition look! Great blog you have, stay inspired! Hi. It was a gift for Christmas, and came in all the Chanel packaging, so I am not aware it is 'Fake'. But I appreciate you really wanting to point this out to me. Beautiful outfit..I love the jacket! !